I tend to consider myself a realist. I am aware that some people want to book their travel on their own because they don't want to give up control of their vacation. Other people also think that big online agencies, Orbitz, Expedia, etc can provide better prices. The fact is, they cannot! The majority of cruise lines prohibit discounting and rebating cash for cruises. So why should you use Sunkissed Adventures over an online travel retailer? I provide you with personalized service. We can get you out of a rut when things don't go as planned. We can secure great pricing and onboard perks for your cruise vacation because we partner with a large consortium of agents and agencies. We DO NOT charge you unnecessary fees. Booking with us will cost you no more than your vacation list price! (561) 702-2096 is answered on many nights and weekends! We've even taken a call at 1:00am Not that we would like to encourage that sort of thing ;) But we're here to provide you with a painless experience. I have experience in the travel industry with the numerous connections made over the years. I have first hand experience traveling as a guest. Just like you I know what is important and what counts. I've been there, done that and would LOVE to tell you all about what I recommend. 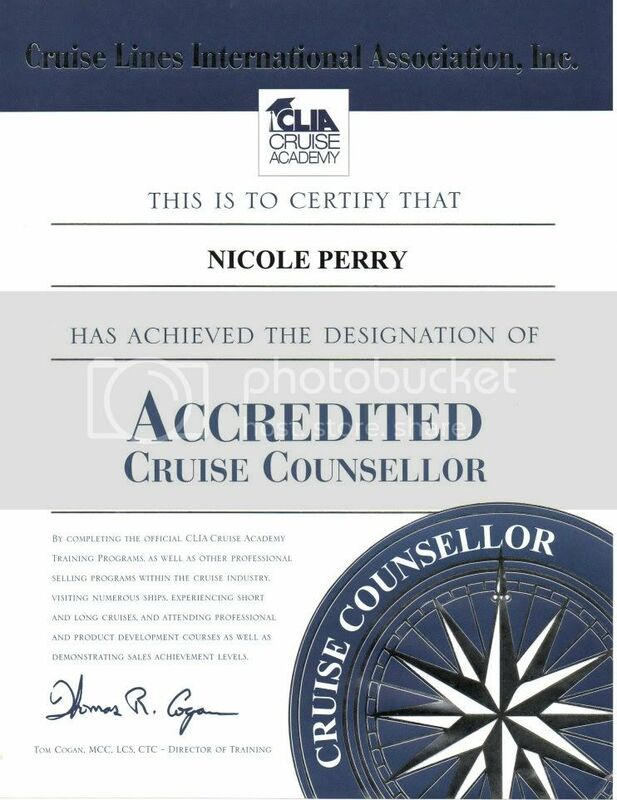 I am an Accredited Cruise Counsellor with the Cruise Lines International Association, currently one class away from a Master Cruise Counsellor! I am constantly engaging myself in webinars, online training opportunities, and participating in ship inspections to get the the information you want to know about the newest ships. Many of the above benefits do not apply to large online agencies. As you can see, there is a lot of benefit to using Sunkissed Adventures. I'd love to have you as my newest client. And thanks to my reliable regulars, I love you too!